What’s the cure for a sad, sad selfie-pout? Cricket Wireless says it’s a new smartphone from Cricket. The company has released a new commercial, highlighting that you can get a FREE LG Fortune 2 when you switch. 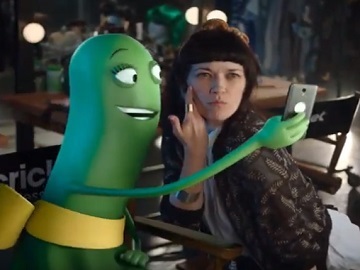 The 15-second spot features the network’s mascot Rose in the backstage, with the make-up artist, who asks her if they can take a selfie. Rose agrees and encourages her to smile while she snaps the photo. The make-up artist comes up with the idea of making the selfie-pout thing, but when Rose tells her that, if she switches to Cricket, she can get a free new smartphone, which makes the woman give up the selfie-pout thing and show a large smile instead. “Works every time,” Rose says. Rose has also starred in Cricket’s “Four for the Holidays” film, from agency Argonaut, San Francisco, which features her and her friends Dusty, Ramon and Chip on set, filming a commercial for the network, in which they sing about how Cricket keeps them “sharrier” with four lines of unlimited data for $100/month.